With all the ambience of an airplane hangar, Harrah's Philadelphia Casino and Racetrack (formerly Harrah's Chester) still packs 'em in! You'll also find some of the nicest and friendliest employees to be found in a casino (or any large operation – think Target or Walmart). All employees – no matter what their jobs – seem to be honestly concerned that you have a great time, even to the point of asking if their fellow employees treated you well. Unlike most Caesars properties, though, there is no hotel here. . .this is strictly a casino (or racino, to be more accurate), with a seasonal harness racing track operating from March or April through December. The 2019 Live Racing Season begins March 29 and ends Dec. 15. Click here to view the 2019 schedule. In addition, horse races from around the country are simulcast year-round on the second floor. The casino is very large and may appear extremely crowded when you walk in. However, take a few extra steps to walk toward the other end, and you will find it's much less crowded. While there is the usual array of slots and video poker, along with electronic versions of blackjack with a "dealer" on a video screen interacting with players and "dealing" cards, there also is "live" table gaming. Alcoholic beverages on the floor (but not the Laurel Lounge) are complimentary (see below), and there also are complimentary self-serve soft drink dispensers located throughout the casino, right, but they are frequently out of service – either the beverages are depleted, the icemaker is broken, or there are no cups. Pennsylvania law requires that the casino stop serving alcohol at 2 a.m. Service begins again at 7 a.m. Monday through Saturday and on Sunday at noon. Harrah's runs a complimentary shuttle from downtown Philadelphia. For information, call (267) 538-7407. You can charge your cellphone for free if you have a Caesars Rewards card. Look for the charging stations on the casino floor. You can also charge your phone at certain slot machines throughout the casino. The Poker Room on the second level is moving to The Block, located at the rear of the casino (where Temptations Buffet used to be). C-Bar is a lounge located in the center of the casino floor with comfortable lounge seating, table-top video poker built into the bar and a state-of-the-art video wall. The Book, Harrah's Philadelphia's sports book, offers wagering on pro/college football and basketball, baseball, hockey, soccer, golf, and more. The Book is equipped with 19 lounge seats, 11 high-top tables, bar seating, and more than 45 large-screen TVs that can be configured in numerous ways. Food and beverages tailored specifically for game days also are available. The Book is open every day until midnight, with a 10 a.m. opening on Saturday and Sunday, and an 11 a.m. opening during the week. Nearby, just to the left of the entrance to Harrah's World Series of Poker Room, above, look for three Topgolf Swing Suites, right. (Harrah's relocated its Poker Room into the area which was formerly The Block, an entertainment venue in the rear of the casino to the left of The Book.) These golf simulators are small pods with lounge seating where folks can compete by hitting golf balls at a projection screen. The screens also can be adapted to throwing baseballs and footballs, or even dodgeballs at zombies. Topgolf already has installed Swing Suites at the Ocean Resort Casino in Atlantic City. Food service runs the gamut from the Cove Steakhouse & Raw Bar, the casino's full-service "fine dining" restaurant, to The Market. The Market offers breakfast, lunch, dinner and late-night dining options, featuring salads, pizzas, Italian-style deli sandwiches, baked pastas, panini and other made-to-order specialties. Additionally, The Market offers guests a selection of house-made soups, yogurt parfaits, fresh fruit and juices. Reward Credits are accepted 1:1 and Seven Stars cardholders get a 10 percent discount, but only if they pay cash. The area's first Starbucks is now open, as well. It's open 24 hours a day and, in addition to the standard coffee, tea, and other hot and cold beverage fare, customers can get breakfast sandwiches, pastries, etc. Reward Credits are accepted on a 1:1 basis and Seven Stars cardholders can get a 10 percent discount by showing their players card and paying cash or by credit card. Guy Fieri's Philly Kitchen + Bar. Philly Kitchen + Bar "offers guests a taste of Fieri's signature cuisine, featuring daring flavors and unique twists on traditional dishes." The restaurant offers a variety of burgers, wings, tacos, small bites and shareable items, as well as a diverse menu of adult beverages. Reward Credits are accepted on a 1:1 basis and Seven Stars cardholders get a 10 percent discount, but only if they pay with cash or credit card. Just off the casino floor next to the high limit slots area there's also a small Asian restaurant, Mien Noodles. The same 10 percent discount applies for Seven Stars cardholders who pay with cash or credit card. Save yourself a little cash and use the complimentary self-serve soft drink dispenser at the Copper Mug rather than purchase a fountain drink at Philly Steak Shack. On the second floor, Philly Steak Shack serves hoagies, cheesesteaks, hot dogs, salads and other casual dining fare. A Krispy Kreme is located adjacent to Philly Steak Shack. In addition, you can enjoy a beer or cocktail at The Copper Mug. Now that The Block has become the Poker Room, entertainers perform on a small "stage" at the "Winner's Circle" on the casino floor near the escalator leading to the Laurel Lounge. Other shows take place in the Event Center on the second floor. Seven Stars cardholders may make unlimited daily visits to the Laurel Lounge (see below); Diamond members (with one guest) are limited to one visit per day. In addition, Seven Stars cardholders have reserved tables and may request a special dessert from their server. If you’re on Level 3 in the reserved Seven Stars area of the self-parking garage, don’t follow this exit sign. Keep going straight ahead, then turn right. If you exit where the sign points, and there are parked cars they will block you from accessing the gate which allows you to leave. In any event, it’s quicker and easier to continue to the next aisle where you should turn right at the blue “Seven Stars” sign. While there is a five percent check-cashing fee, it's waived for Seven Stars cardholders and Diamond cardholders who earned 80,000 tier credits, but the fee is returned in the form of free play. Seven Stars cardholders get a 10 percent discount on menu items at the Cove, Mien, The Market, Starbucks and Guy Fieri's, but only if they pay with cash or with a credit card. There is dedicated parking on the third level. (Diamond cardholders have a similar dedicated parking area on the second level.) Use your players card to open the gate; however, frankly, if space is available, parking on the fourth level is really more convenient because you can walk right into the casino level. Other benefits include dedicated Seven Stars windows at the cashier, a complimentary copy of the daily Racing Form, and complimentary and priority valet service. There is no Seven Stars Lounge, but a spacious Laurel Lounge (former Diamond Lounge) overlooks the casino floor on one side and the racetrack/river on the other. Look for the escalator near the C-Bar in the middle of the casino. (There also is access by elevator.) Seven Stars cardholders and up to three guests may make unlimited daily visits. Diamond cardholders who earned 25,000 to 149,000 tier credits last year (or during the current year) may visit the lounge with up to one guest on a complimentary basis, while Diamond cardholders who earned 15,000 to 24,999 tier credits last year (or during the current year) may visit the lounge with up to one guests for 1,000 Reward Credits ($10) per person. Harrah's Laurel Lounge has a large bar, and lots of seating, but only soft drinks, coffee and water are complimentary. While alcoholic beverages are complimentary in the casino, there is a small charge in the lounge, e.g., $2 for a glass of house wine. The day's menu is posted on a video monitor at the base of the escalator leading to the Lounge (see sample below), can be accessed on the Laurel Lounge page of the Harrah's Philadelphia website, or by calling (484) 490-1795. In addition, there is a self-serve soft ice cream machine and a coffee bar. The lounge is open Mondays through Thursdays from 4 to 9 p.m., Fridays and Saturdays from 3 to 11 p.m., Sundays from 3 to 9 p.m. Hot food service ends at 8 p.m. Sundays through Thursdays, and 9 p.m. on Fridays and Saturdays. Hours are always subject to change, so check first. The Caesars Rewards Center is open Mondays through Thursdays from noon to 1 a.m., and Fridays, Saturdays and Sundays from 9 a.m. to 1 a.m. It's an option, but since there is no hotel a host may be able to arrange accommodations at the nearby Wyndham or Springhill Suites. Unless you have your own transportation, you'll have to depend on the hotel's van service. With Atlantic City just a little more than hour away, that would be your nearest alternative. Also, note that casinos without hotels are under no obligation to host your annual retreat, or even provide you with a complimentary hotel room during any visit. ■ The direct number to Harrah's Philadelphia is (484) 490-1800. ■ Free parking is available in an adjacent self-park garage. Complimentary valet service is available daily to Seven Stars, Diamond and Platinum cardholders. Monday through Thursday, excluding holidays, valet service is available to all guests. (Look for Randi; he has been handling valet since the casino opened.) Note that, after presenting your claim check to the valet cashier, you retrieve your car toward the rear of the building in an enclosed underground area. 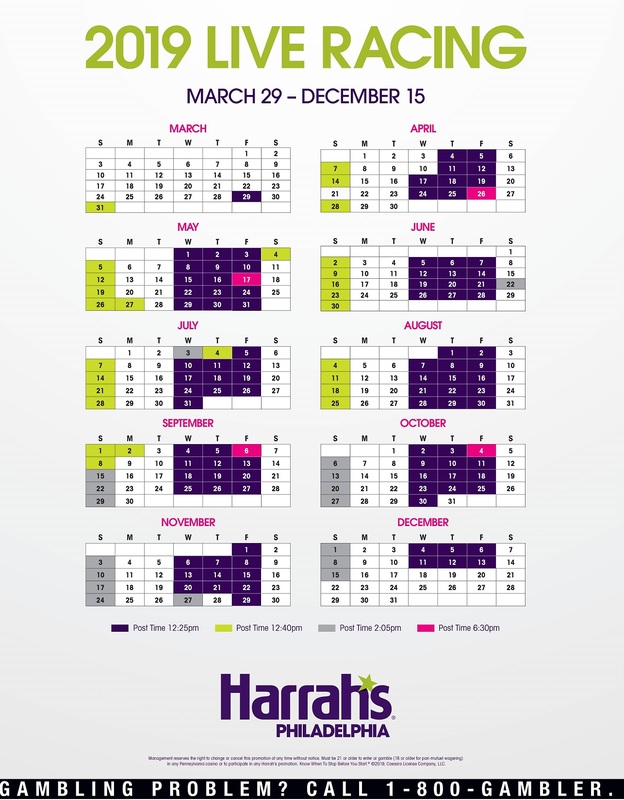 ■ Harrah's celebrates "Diamond Day" in the Laurel Lounge on the third Friday of every month – date subject to change, so check first. Enjoy an upgraded and themed menu with the chance to win free play and other prizes. ■ Pennsylvania has a Clean Indoor Air Act; however, more than 1,700 of Harrah's 2.800 slots and video poker machines, in all denominations, are "smoker friendly." Smoking also is allowed in the Laurel Lounge, but only at the bar. ■ Guy Fieri’s Philly Kitchen + Bar is now open for lunch and dinner starting at noon every Thursday. In addition, from 4 to 6 p.m. Tuesday through Thursday and 10 p.m. to midnight Friday and Saturday, Harrah’s has introduced a “Social Hour” featuring $8 wings, chipotle BBQ pork tacos, big bite Caesar salad and spinach + artichoke dip. ■ Wheelchairs can be rented for up to six hours for $10, for up to 12 hours for $15. Wheelchairs returned after the contracted time limit will be billed $3 for one hour and at the same rate for each additional hour. Fees are waived for wheelchair rentals if a guest shows valid state-issued disability ID card. Scooters can be rented for up to four hours for $25, for up to eight hours for $35, and for up to 12 hours for $45. Scooters returned after the contracted time limit will be billed $5 for one hour and at the same rate for each additional hour. A valid state-issued ID is required for all rentals. Payment options are cash, credit cards and Reward Credits. ■ When Harrah’s says that downloaded free slot play expires after 72 hours, it means it. The clock starts ticking as soon as the funds hit your bank. In other words, if you download slot play at 8 a.m. on Tuesday, it will expire at 7:59 a.m. the following Friday. ■ Call (484) 490-1795 to get the daily Laurel Lounge menu. ■ While Guy Fieri's, Mien and The Market would be great to take the family, they are located on the casino floor, so no one younger than 21 can be admitted. That leaves only the Philly Steak Shack on the second floor and the Cove. ■ Save a little money when you eat at The Market. Use the complimentary self-service soft drink machines on the casino floor and bring your beverage with you. ■ Visit any of more than 30 restaurants, spas and salons, and other local retailers in the Greater Philadelphia area, present your Caesars Rewards card, and earn Reward Credits. $1 = One Reward Credit. For a list of participating locations, click here.